Take the Glenn Highway to Eklutna and turn West (left) after the off ramp; go less than .25 mile and the church is on the left. 5:00 PM Vigil followed by Confessions. 8:40 Hours; 9:00 AM Divine Liturgy. 5:00 PM Akathist to St. Herman of Alaska or Akathist is to the Mother of God-Healer of Cancer. Check monthly schedule. 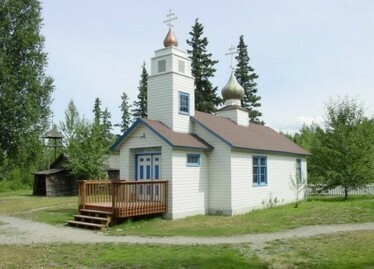 Formerly a parish, the church was redesignated a Skete under St. Herman Monastery, Spruce Island, AK in 2007. It has currently been returned to parish status.